The Kelvin scale is an absolute scale, with 0 K being the coldest temperature possible: 0 K is equivalent to a temperature of -273.15 °C or -459.67 °F. This temperature is referred to as absolute zero. It would be a state of matter in which all molecular motion has stopped. We could never cool something to that temperature because of quantum effects, but we can approach it. The coldest temperature achieved in the lab (to date) is 0.006 K.
In deep space, where very few molecules are present, we can’t define temperature in terms of molecular kinetic energy. What we use instead is called the black body temperature of an object. 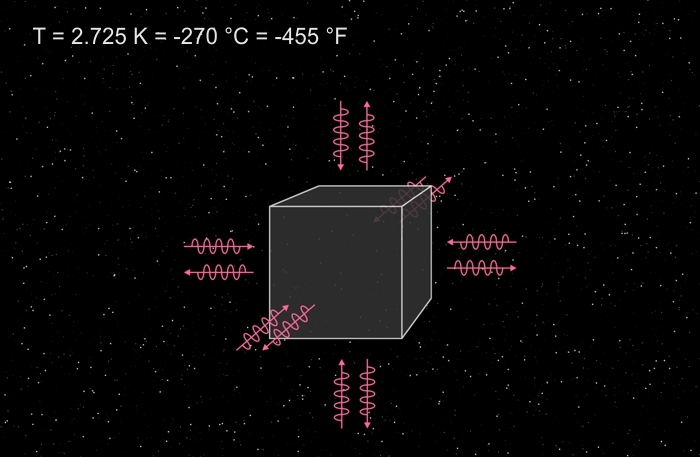 Space itself has no temperature according to the above equation, since it’s (nearly) a vacuum. The molecular density is too low for the molecular kinetic energy to be of much significance. But by using a hypothetical “black body” located in outer space we can define the temperature in a different way. Imagine a cube of metal painted flat black, and sealed inside a transparent chamber containing a vacuum. Take it outside and set it in the sunlight. The cube will absorb heat radiation (photons) and start to warm up. As it gets warmer it will emit more and more heat radiation. At some point, the rate of heat emission will equal the rate at which it is being absorbed, and the cube’s temperature will thereafter remain constant. It will have reached thermal equilibrium. Of course, if you’re near a star like the Sun, the side of the black body facing it will warm to a higher temperature. Astronauts who do space walks, and those who walked on the Moon, know this effect well. On the Moon, when in sunlight, temperatures can be as high as 200 °C (392 °F). In the shade of a mountain, temperatures drop to -200 °C (-328 °F). Those are the temperatures of the lunar regolith, which has a grayish-tan color and an albedo of 0.12 (it absorbs 88% of the incident light). So depending on the color of your space suit, you could be warmer or cooler. Equipment built to function in space is typically shielded with a shiny reflective coating. This is done to prevent overheating from the Sun. In general, electronics function better when kept cool. That’s why space suits, and much of the ISS, are colored bright white. There’s a nice image of both here. The albedo of current NASA space suits is around 0.90, so they reflect 90% of the photons striking them and help prevent the astronaut from overheating.